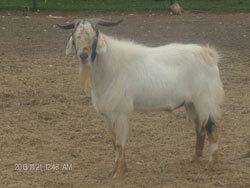 The Kiko Goat breed was originated in New Zealand by crossing feral (wild goat) with dairy goats in the 1980's. In the Maori tribe the word "kiko" is a word for meat or flesh. This is a breed developed for their survivability and hardiness and fast growth with little input from the producer. The associations: American Kiko Goat Association, and the International Kiko Goat Association allow tracking by the National Kiko Registry created in 2011, allowing the opportunity to "register, and track their genetics through an independent and professionally run, for profit registry." From Wikipedia "The Kiko goat was developed firstly by Caprinex Enterprises Limited and later by Goatex Group Limited, New Zealand companies responsible for the breeding of Kiko goats in New Zealand. These companies of Farmers were actively involved in the capture and farming of the New Zealand's extensive native goat population. All members had a vigorous and ongoing interest in meat production as a consequence of which sever thousand of the most substantial and fertile goats were screened into a breeding program in which population dynamics was rigorously applies to produce a goat with enhanced meat production ability under difficult management conditions. New Zealand large population of feral goats roamed unrestrained through the wooded hill country and mountain scrubland. These goats derive from the original imports of British milk goats introduced in the late eighteenth century to provide sustenance for whalers and sealers prior to New Zealand's colonization. Over time they have been supplemented by escaped and released domestic goats turned into unproductive scrubland during time of agricultural adversity, particularly the depressions of the 1890's & 1930's. New Zealand's total lack of predators and temperate climate meant that feral goats have been able to breed without the strictures of mortality that are found elsewhere in the world. In addition, they rapidly adapted to the environment into which they had been released and established themselves throughout the country. As a consequence, comparatively small numbers of goats released into the wild had burgeoned to hundreds of thousands of goats by the mid 1970's." The Kiko breed was imported from Goatex Group Limited by American ranchers in the 1990's and along with other sources within North American, the American Kiko Goat Association was formed in 2000. Now the American Kiko Goat Association requires all sire be genotyped and match their sire DNA. All purebred does born after January 1, 2008, have been genotyped increasing the accuracy of the registry. The Kiko breed's ability to survive all types of weather, climates, and terrains are highly desirable traits to be considered for any breed and come nicely packaged within the Kiko breed! At Reflections Ranch our livestock is 'Raised in Harmony with Nature' and are able to free range during the day. When their internal 'clock's strike sundown' they present themselves to their respective pens, protected from predation. We do not use inorganic fertilizers on our fields and have not since the inception of Reflections Ranch in 1992. Year round our livestock receives free choice the natural wormer diatomaceous earth along with the mineral/supplement, kelp, all mixed together with range salt as a limiter.